After a lot of hard work and one postponed trackday, the time had finally come to attend our first trackday. We'd chosen Cadwell Park as it was close to one of the team members, it meant that we had lots of support on the day, so if anything should go wrong we had every chance of sorting it out. It was also one of my favourite tracks and at £185 for three drivers inc. helmet hire it was good value for money. The question at the back of my mind was could we get to Cadwell (around 170 miles), do a full trackday and get back 170 miles. On the journey over from Manchester the night before the car had been well behaved, we'd never done a two & half hour drive before so it was a little daunting in a 22 year old car, but the trackbitch performed well and we passed the first part with ease. We arrived at the track early having only a short 30 min drive to get there, the track day was a novice day (maximum three previous track days) so we didn't feel too intimidated on our first outing. To our surprise the car park was full of motorbikes, had we turned up on the wrong day? No, MSV had split the day into a bike and car day, fortunately we weren't all going out at the same time, the day was in three sessions, one cars and two bikes every 20 minutes. We eventually found the other cars in a corner of the car park, a complete mix of vehicles, two M3s, an M5, Audi TT RS, Mercedes SLK AMG, Honda S2000, Ford Puma, Leon FR diesel and a MK1 MR2, someone had an older car than ours! We registered nice and early and then set about our first slightly daunting task, the noise test. 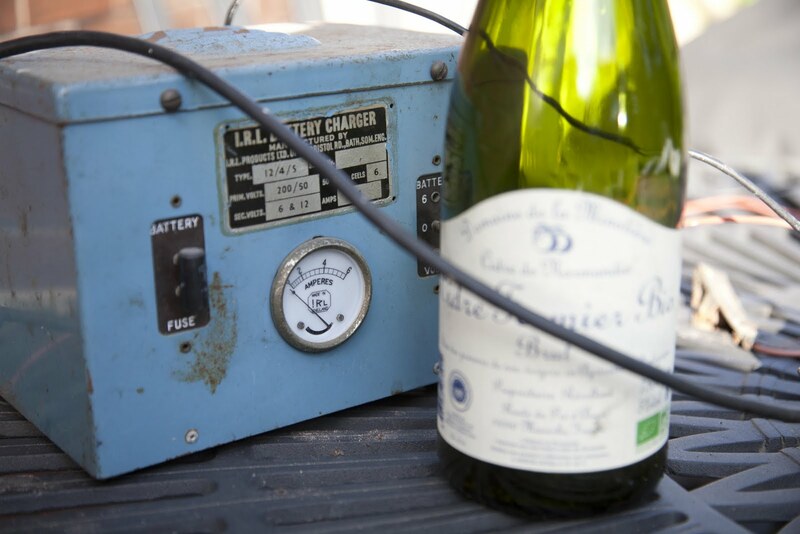 The car is quite noisy and whilst we had used an iPhone db meter to measure the noise the week before, they are not very accurate, so we approached the testing bay with a degree of trepidation. It was our turn, we revved to 4.5k revs for the required amount of time, omitting a largish bang when backing off the throttle, the guy said 'you're fine mate', we'd passed, we asked for the reading out of curiosity, 98db against a limit of 105db. After the obligatory driver's briefing we picked up our helmets and join the crocodile of cars for the sighting laps. These are good for getting use to driving on track and finding your feet at a slower pace, but totally rubbish for giving you the lines (like they are suppose to do), if you're any more than three cars back you've got no chance of following the pace car's lines, as each driver adds their own personal touch to the line, by the time it's got to the back you've got no idea what the line should be. Not to bother it was good to get the trackbitch on track and get a feel for how it would perform. 10.00am arrived, this was the first session of the day out of the seven we'd paid for. We strapped ourselves in nice and tight, I omitted the ball cruncher bottom harnsess and settled for four points, that kept us nice and tight in the car. I was driving the first stint, this was it, the first proper outing in our little, red, 22 year old French hot hatch. I was slightly nervous but having driven Cadwell twice before I was also really keen to see how it would compare to my old 182 Clio and current Megane R26. They normally tell you to start off slowly and build your speed up throughout the day, I decided to ignore this and go on full attack mode, I quickly built up the speed and soon over took some of the other cars, we then found a nice little gap with no one to bother us. The car felt very good indeed, more stable at high speeds than I anticipated and easier to drive on track than I had expected. We'd had the car tuned on a rolling road but most of the power is only accessible after 4,000 revs so I had expected that driving on track would take a bit more concentration to keep the car in the sweet spot, however the Cadwell track really seemed to work well for us with no forced gear changes, no section where you are required to change up only for a small moment to then have to change down a gear. The brakes also performed well, again a lot better than I had expected, I am sure there are improvements to be made in the future, but for now they are more than adequate. I still lacked some confidence in the high speed corners due to not really knowing what the car can take and also not wanting to roll a 22 year old biscuit tin (we still need to fit that roll cage). The car did however run very hot with the needle showing well over three quarters on the temp gauge, it was a hot day and the car is renowned to run hot but it was a little high, another future upgrade could be cooling. The 20 minutes was soon up, probably for the best as we didn't want to push the car for much longer without checking things out. The Red Baron on-track at Mansfield corner. We arrived back in the paddock and gave the car a quick once over, apart from a slighly leaky pipe on the the turbo which was quickly tightened up everything was OK, we'd survived session one. Session two soon came round and it was time to change drivers, time for a passenger ride. On the way back in from my session, my mate said, 'Out of 100 how much were you pushing then? ', I replied 90. I was soon to learn that my 90 was more like a 70. We pulled out of the pit lane and started our session, once again quickly picking off the slower cars and allowing the faster M-Power BMWs to get ahead of us. What then proceeded was a true assault on the track pushing the car to its limits seeing what it really could do, I normally make quite a good passenger but not for the next 20 minutes, I spent most of it pressing a fake brake in the foot well. Once again the car performed very well indeed, comfortably passing an Audi TT RS, Mercedes SLK AMG, Honda S2000 and track setup MX5, the car was punching well above its weight and doing us proud. On the penultimate lap of the session an M5 had caught us up towards the end of Park Straight too late to be let past, just before Gooseneck we found the M5 on our inside without invitation and decided that it was best to take to the grass to avoid any potential contact, we'd had our first off! At the time I did not know what was going on so was truly terrified when we started heading over the grass towards the tyre wall, however everything was under control and we soon headed back onto the black stuff. Again the car was running very hot by the time the session was over so it was good to get back to the paddock and allow it to cool down. We attracted a lot of attention in the paddock, with lots of people interested in the car and our project, the guy in the Audi TT RS was particularly impressed that our £1100 trackbitch could perform so well. The guys in the M5 complemented us on our ability to 'tripod' around the circuit, they said that the back wheel on some corners was cocked at least 10 inches in the air. Luckily the car blew on the last lap of the session, it had dropped no oil on the track so we were quickly towed off the circuit and the bike session was able to start on schedule. The car was allowed to cool down in the paddock before we then tried to diagnose the problem. Every time we started the car, clouds of white smoke poured from the exhaust, it was clear our day was over. Due to logistics and other commitments, we chose to take the car to a known local garage to get the car's problem diagnosed, we suspect a head gasket, but until we strip it down we can't say for certain. If it is the head gasket then it'll give us a chance to upgrade it to a higher spec part. Overall, we were delighted with how the car performed on its maiden track day, holding its own against much more expensive machinery. The wait now goes on to find out what we need to do to fix the car. Stripping the interior, bucket seats and 6-point harnesses. There was now only one major thing left to do to The Trackbitch before our first track day in one weeks time, lose some unnecessary weight and put in some better seats with harnesses. The seats were picked up off eBay; two used Cobra Monacos in blue (shame we couldn't get red to match the car) we felt the seats were a bargain at £100 for the pair and with the person living two miles away it would save on a fortune postage. Harnesses were also picked up off eBay, we were only looking for 4-point but some 6-points turned up and as our seats had a hole to stick the extra two points it was a bit of a bonus. We again got lucky on the price as we paid £130 inc. delivery for two used 3" OMP harnesses with aircraft buckles, they were still in date too, FIA approved until 2012. Demon Tweeks sell these new for £293 for two, so we were very happy to pay less than half price. Next up were the seat rails to allow our Cobras to fit onto the original 5's seat mounts, unfortunately these had to be bought new due to time constraints, so another £130 was forked out. All the old seats were pulled out with great ease, first the rear bench, rear seat belts, rear interior trim, next up was the two front seats and seat belts. Inside an hour the car had been stripped. Old & new seats side by side - bit more support on the Cobras. Work in progress - Team Baron in the background. To my surprise the harnesses went in with ease, holes were drilled in the boot well for the main shoulder straps and clipped onto proper bolt mounts. The side straps just used the fixing points for the old seat belts, however we still need to fit the bottom straps correctly using mounts (we did not order enough), we have been able to fit the driver's seat with the full 6-points though, tying off the straps onto the bottom of the seat rails. With the correct Cobra to Renault 5 seat mount adaptors the seats were easily bolted in, there's obviously no tilt but the seats slide forward and back allowing each trackbitch team member to be at the right distance from the pedals. We had thought that it might not have been possible to have any adjustment back and forth, so were pleased when the mounts allowed this. Finally, after many days of hard work we were ready for our first track day. It was now just under a week to wait. We've also managed to sell all the seats (front & rear) on eBay and through the owners club, this added £95 back into the bank account. In total we've only paid £265 for our new interior. Since we first set our eyes on our 5 we were always going to remove the rear wing as it was too Ali G for our liking and added unnecessary weight to the car. Well the wing was removed quite a while ago now and due to lack of filler at the time we just filled the holes with some old tile grout. In the same session we also removed our stupid wing mirrors and replaced with some scruffy items purchased off eBay, however the car was starting to look a little scruffy and I thought it was time to tidy things up. So after a trip to Halfords to buy filler, primer and various grades of sandpaper I made a start on the top of the boot lid and wing mirrors. I've never done any cosmetic work on a car before so after viewing a couple of videos on YouTube I set about filling holes with the stinky gunky filler, overall it proved to be an easy job and I was surprised how quick it dried with not bad results for a newbie. Next job was to sand down the whole top section of the boot lid, I really should have resprayed the whole boot lid but as we're not going for a full Concours restore on the car I went for the easy option, anything was better than some ropey old tile grout that had started to leak. Mirrors were also sanded down and now it was time to prime. In total the boot lid and mirrors had three coats of primer with sanding down in between, quite a messy job with lots of red dust flying around everywhere, also wiping down the car in between coats of primer proved frustrating for someone with no patience and short on time but a spare afternoon sorted out the first stage of the respray. After some researching on the internet I found Paint for Cars who will mix you any paint colour code and stick it in an aerosol, bundle it up with a can of lacquer and send in the post for just over £20. The parcel arrived within a week and now it was time to spray the car with some shiny red apple coloured paint. The car was taped up again with lots of newspaper and given three coats of the red paint, again I was surprised with how quick it took to dry, with only 30 - 40 mins in between coats, it meant I was able to spray the car with all the required coats of paint after work one evening. Day three - after the three coats of primer and three coats of paint it was now time for another three of lacquer and our trackbitch would be back looking normal again. This was easily applied, again one night after work and within a couple of hours it was time for the grand reveal. Overall, we're pretty pleased with the results particularly the wing mirrors as the colour match is very good. For £1 items off eBay they look really good. The boot lid looks fine from a distance but due to the lower boot having a more professional finish than I was able to conjure up at the top, the match is not as good and there is a very obvious line between the two sections of spraying. However, the boot looks better without the massive wing and also looks better than having tile grout in four holes, so we're pretty pleased that for £40 and a few hours work the car is now looking almost normal. We've done a few trips out in the car but since finishing all the mechanical work and getting the car set-up on a rolling road we'd not been out for a proper drive. So on a hot sunny Sunday morning and with a friend's VX220 for company I went out for a morning's drive. The route we took was a familiar one, A34 down to Alderley Edge, B5087 to Macclesfield, A537 up to the Cat & Fiddle Inn, then back down the A54 to Congleton. For the first time the drive out would allow us to understand how the car performed against another car and see if it behaved itself on a longer drive out. The other car was a standard VX220 N/A which has 145 bhp, but weighing only 875kg means it has 168 bhp/ton. From a standing start the VX had a lot more low down power and the Renault appeared to be slightly sluggish in comparison, it really was apparent that if not kept above 3,500 - 4,000 rpm the Renault could not keep up with power delivery in the VX. However when the Renault was up to speed and on a twisty road and kept in the desired rev range it could easily hold it's own. In the corners the VX handled slightly better but accelerating out of the corners the Renault could pull away. It was a pretty even match with each car exploiting its strengths on each of the roads we went down. One other thing to remember when comparing cars is that turbo cars, especially turbo cars with a large turbo and small engines can be laggy. Driving against a normally aspirated car on the road - means we will have to thrash it to make our power work. As already stated this is tricky to do on public roads. However on track this is much less of an issue, we are far more likely to keep our car in the power band and keep the lag to a minimum, but ultimately we will find out on the track. The triangle of roads we use can be pretty busy on a Sunday however we seemed to get lucky, particularly on the final stretch towards Congleton, with no traffic on large sections of the road. The car can be quite savage when on boost and you have to be quite careful not to mash the throttle as it can lead to the wheels spinning up (maybe some better rubber can assist with some of this). The car now handles a lot better since we have restored the axle back to its original ride height and added the GAZ adjustable shocks, however I still need to build up the confidence with the cars limitations, something I don't want to be doing on public roads. 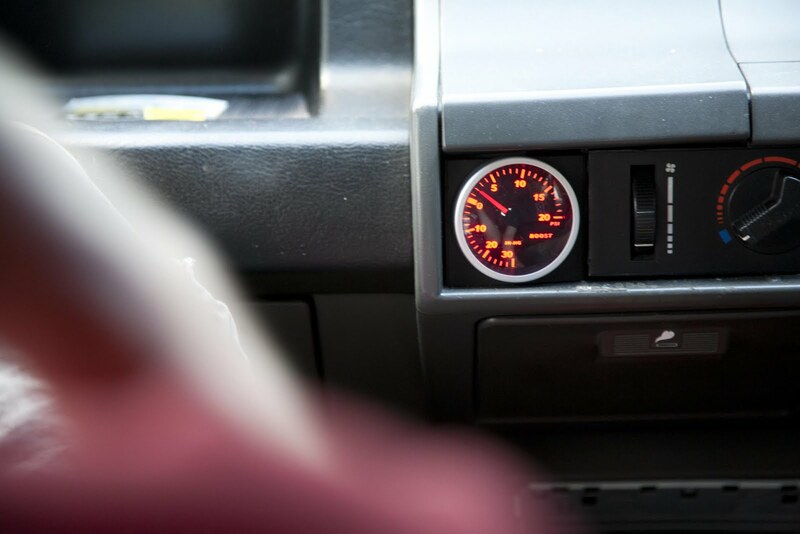 As mentioned previously it is critical to keep the car on boost and any incorrect gear changes will lead to the car bogging down and not being able to get back up to speed as quick as you might like. On the trip out a couple of people even passed positive comments when seeing the car, a nod of appreciation from a biker and complements from an Audi owner who use to own one himself. Overall the car performed very well and we're now confident that it should not embarrass itself on its first track day. We've booked Cadwell Park on Wednesday 3rd August so we'll soon find out. Setting the car up - an update. The car was now setup and ready for it's first track day, however there was something that we thought was not quite right, the bhp we were producing seemed a little low. Whilst 157 bhp was a good performance gain and is still a lot of fun to drive, we were hoping for about another 10 - 15 bhp more from our set-up. This led one of the more mechanical owners of TrackBitch to head to the forums and enquire about what we have got, with some interesting responses. Our rolling road said - 143bhp at the wheels but calculated 157.6 bhp at the flywheel. When the rolling road calculated flywheel BHP at the start he calculated a drive train loss of around 20%. For some unknown reason once tuned he calculated a drive train loss of about 10% - which is physically impossible. Drive train loss is much more consistent, if anything it is more at low power NOT less, in his calculations for us drive train loss changed and was FAR more at high power? If you enter fwd and 143 whp in to this calc it gives our car a maximum 170bhp and a power to weight of 205bhp per tonne. We still have the option to safely add about 3 psi of boost (due to setting up at around 15psi carb base instead of 18psi carb base). So we can probably expect 180+ bhp in the near future. Ultimately what really matters is wheel horse power - torque at the wheels is the only accurate measurement a rolling road can offer, but as manufacturers use flywheel horse power (because they dyno their engines on a bench not in the car) then we have used flywheel bhp for comparison to other cars. Lastly, we don't think we have a lazy turbo - we think at high boost (20psi +) we may well have a boost leak, probably at the wastegate, due to wastegate creep (probably caused by our poorly T3 actuator - which has no adjustment in it) or a possible leak elsewhere in the boost pipe work or the inter-cooler. The full posting can be read on RTOC but you'll need to sign in to read it. We all decided that we should get the car set-up properly, plus if set-up on a rolling road then we would finally find out what we had under the bonnet. Finding places that have rolling roads is quite easy, however finding places that have rolling roads and can set a car up that has a carburettor is a little harder to find. After an afternoon of internet searching and numerous phonecalls, one member of Team TrackBitch found Ric Wood Motorsport in Stockport, we asked if he could set it up on the following Saturday, but were told it was not possible as he was at Oulton Park assisting the touring car teams for BTCC. Nothing but the best for the TrackBitch. The car was booked in for the following week and we all placed bets on what bhp we would achieve. I was hoping for around 175bhp, other team members whilst hoping for that sort of figure thought around 160bhp maybe closer to the mark. Setup wasn't cheap either at £150 per hour but it is worth doing a proper job. The car was the last one to be worked on that day, so we had an impatient day waiting to find out. After a couple of hours the car was done, interestingly the car was running lean, when we thought it was running rich, so probably a good job it was set-up by a professional. Out of the factory they were 118bhp so we started in a favourable position. So we'd not quite made the 175 bhp we were after, Ric did say that our Turbo seemed a little weak, which was a bit worrying but that is probably what you get when you have a little gamble on eBay. Picture below shows print out from the day. So we didn't quite make what we were hoping for, however the car now feels so much different, the turbo when it kicks in is quite savage (easy to wheel spin in second in the dry) and if you keep the power above 3,500 rpm you can get from A to B pretty quickly. Clearly it is not a car for 0-60 times but on track driven correctly we are hoping to trouble some more serious hardware. To compare this, listed below are a few bhp per ton figures for some hot hatches. So, new turbo fitted, new rear axle, new rear suspension and a rolling road set-up. Let the fun commence. All three Team Trackbitch team members were back together and we were aiming to finally get the car back on the road. This time were were also joined by an honorary team member Dave Oates who is a professional photographer, he kindly took a load of pictures of us all hard at work which have been used through this posting, he also helped us out with his mechanical knowledge. The turbo was assembled off the car to check all the bodged connectors we'd fitted all came together. With the new larger turbo, larger actuator and larger oil-in line it really was going to be a tight fit. We'd been able to use an adapted oil-out line off a Renault 21 Turbo which seemed to fit OK, the water in and out only required one new banjo bolt and the oil-in fitted with a bit of a squeeze. it was just the actuator again from a Renault 21 Turbo that took a bit of tweaking to fit in place. With the turbo assembled off the car we first had to re-fit the downpipe. Whilst this was off the car we welded in an AFR boss, we could then use an AFR gauge to set the car up and also use on trackdays to check our air/fuel mix was correct. The downpipe proved to be an awkward part to get back on the car and took numerous attempts to finally get attached. With the car only on axle stands it was also difficult working on the car with limited space. After a lot of swearing and forcing the part was attached. 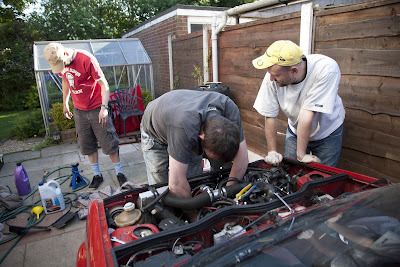 As the car was having a new turbo we also chose to change the coolant as we didn't want to overheat our new turbo. In theory, this wasn't too hard a job, simply disconnect a couple of hoses near the radiator, flush through with a hose pipe, connect the hoses, add new coolant and then bleed the system. For some reason it was pretty difficult to get to the radiator hoses and we spent quite a lot of time taking more of the car apart to get better access to the hose clips. After a lot of swearing and cursing the clips were undone and the system was drained making a real mess over the driveway! New coolant was added and system was bled. Now it was time to finally fit the turbo. The turbo went on OK, oil-out, water in & out were connected up fine. It was the oil-in and actuator that proved to be troublesome, because we'd fitted a new oil-in pipe it was a very tight fitting and the larger actuator was competing for space in the engine bay, however after more swearing we'd finally got the new turbo on and all nuts torqued up. Finally, the new turbo was on. 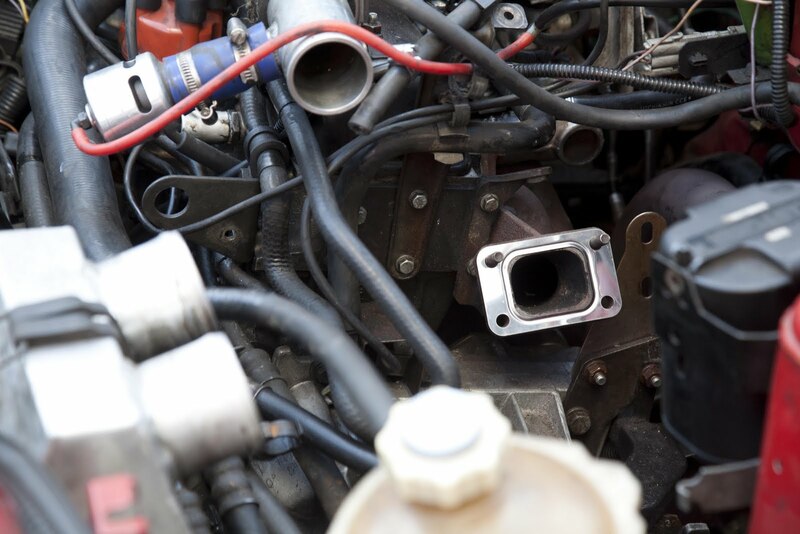 Next step was to prime the turbo with oil before turning the engine over, this is done by disconnecting the electronic ignition and allowing the oil pump to pump oil around the engine. In theory, you turn the engine over (but not fire up) for a couple of minutes and this primes the turbo, the electronic ignition is reconnected and then you start the car properly. 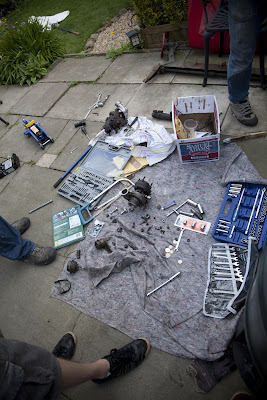 However, the car was turning over but the oil pressure light was not going out, we disconnected the oil-in line at the sump to see if any oil had been pumped through but the banjo bolt was completely dry. It looked like we had an oil pump problem or maybe a lazy oil pump that need the engine running to pump oil through? The way to test this was reconnect the electronic ignition and hope we had a lazy oil pump, if we did we'd see oil come out of the banjo bolt. The ignition was plugged back in and the engine turned over, we must have loosened the banjo quite a lot as it dumped around half a litre of oil on the drive (with no catch pan). We had a lazy oil pump. We attempted to reconnected the oil-in pipe, but it was at such high tension at the turbo side it was impossible to screw back in. This now meant we had to disconnect quite a few of the turbo parts to then reconnect the oil-in line. It appeared you needed a lot of time and patience when embarking on a car project!! 30 minutes later and everything was put back together, all that was left to do now was start the engine. The engine was turned over and The Baron was alive again, there was still a bit of blue smoke, but the old turbo had dumped quite a lot of oil in the exhaust. After running for a few minutes this began to clear. Video of engine running for the first time with new turbo. Due to it once again starting to get dark and everyone short of time, we cut the test drive short. But, at last The Baron was up and running, all we have to do now is set the car up properly, could be a job for a professional at a rolling road.